Tires were about shot. I had to get new ones this month. I priced them out. Then I got the urge to look at wheels again. 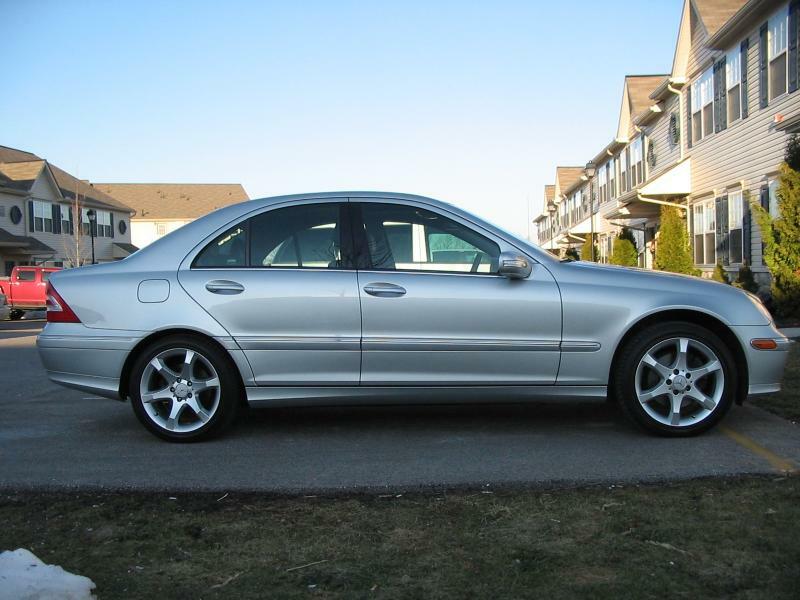 I prefer Mercedes factory wheels over most aftermarket. 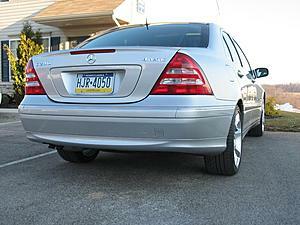 I started my search for a set of four front or back 2007 C230 wheels with tires. 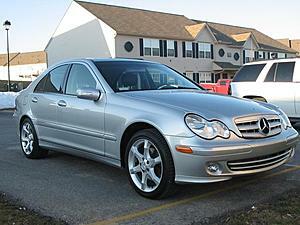 Since all C230's were staggered, and I have a 4MATIC car, I knew, and found out that my search would be near impossible. So at that point I settled on finding something that was a matched set, with brand new or very slightly used, non-crap tires on them. I always kept coming back to E-Class wheels. Everyone pretty much agrees (for the most part) that you can't do W211 wheels on our cars, because the offsets are usually a problem. Also, longer bolts with proper heads are necessary as well, since W211 wheels have a different shaped bolt heads. 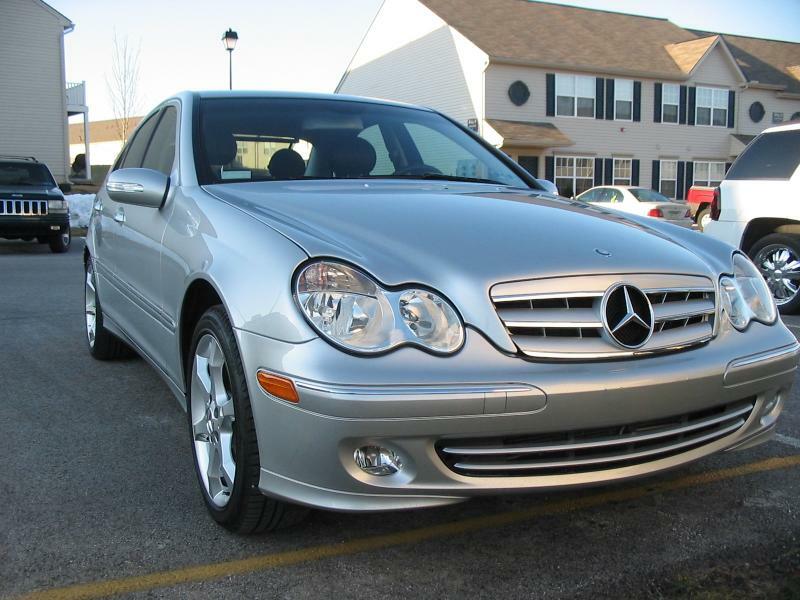 Well, the wheels I kept looking at were from a 2006 E320. They are 16x8 with a +36 offset. I asked a couple of my friends on here, along with the wheel and tire specialist at Schumacher European what they thought, and everyone agreed that they should work, with the possibility of rubbing. I took the plunge, and purchased the wheels and tires. When they arrived, I started to test fit the first wheel up front, and sure enough, when placed on the wheel hub, the tires (with 225 rubber) rubbed against the suspension. so I talked to the wheels guy at Schumacher again, and he referred me to their custom wheels parter, Wheel Specialists in Tempe, to finish the job for me. I have been wanting to get the blue laurel center wheel caps as well. I mentioned this to the tech, and he said that they had a 2009 E in the other day that got new wheels, but since the caps didn't fit, they couldn't place them on the new wheels. He said he would give them to me and switch them out. They re-balanced the wheels as well, so I was out the door in an hour, and I'm pretty happy with the results. I know the wheels aren't as fancy as lots of the other ones here, but I like the factory look, and I think compared to what Mercedes placed on my car as stock, they are 100% better than what I had. Last edited by ChrisBrown; 03-09-2010 at 03:25 PM. Looks nice and clean. Turned out nicely. I ended up selling my 2007 staggered sport wheels to MT8667 and he's got them on his 2005 4matic. Apparently its the overall wheel/tires combination diameter you need to be concerned with. Some say 3%, some say 5%. That said, the car looks very clean, and the 211 wheels set it apart! That looks great Chris. Impressive!. I was one of the idiots consulted. Can anyone who knows 4Matics well tell us why an ET36 wheel caused rubbing on the strut with 225 tyres? Do 4Matics have a different strut, dimple depth or hub set out than conventional W203 RWD's? Standard wheel on the older Elegance/Lux was ET37 & cleared comfortably with 225 tyres. I know because thats what I ran with Pilot Exalto PE2's & I'm now running 17X8XET32 with PS2 235's & they clear the strut just fine. Some input would be interesting. 2004 Civic Si. FWD for the Win! Chris, they look great. 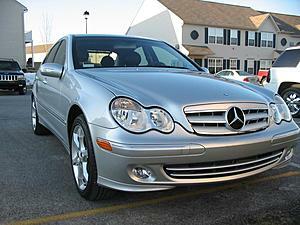 At first glance, i bet people think it's and e-class. You know how associations go. Glyn, you're not an idiot! Tommy, it really wasn't that much trouble, and for the money that I saved altogether, it was very very worth it. Once it stops raining in Phoenix, I'm hoping to get the car cleaned up tomorrow or Thursday and take some better pics. I'm quite proud of the car now. mt, the wheels look good on you. I like the grill too. Very clean. Thanks, its a really cheap plastic ebay grille, in fact I'm afraid of breaking it every time I close the hood, but I love the way it looks! Oddly enough, it did come with an brand new boxed OEM center star. Tommy - Chris, like me, values comfort. 16" with higher profile tyres is the answer to this. Gotta love Arizona. Now I need to get the car detailed. Saturday here I come! Last edited by ChrisBrown; 03-10-2010 at 11:35 AM. Agreed. It's a Benz after all. I'm sure that made sense to you. I don't get it, though. I take this post as evidence that the 07 c230 stock sport spider wheels will fit on a 05 c230 sport. Are they any issues with mounting or fitment upgrading to the 07 wheels from the completely stock 05 (tires, breaks, and all)? Automatic transmission here. Will I need new tires? Has anyone ever upgraded to the 2007 stock wheels on an earlier w203? Know of anyone who has successfully? I'm wondering if I'll need spacers. Anyone have any perfect 2007 stock wheels to sell or have a suggestion where to buy? Thanks. 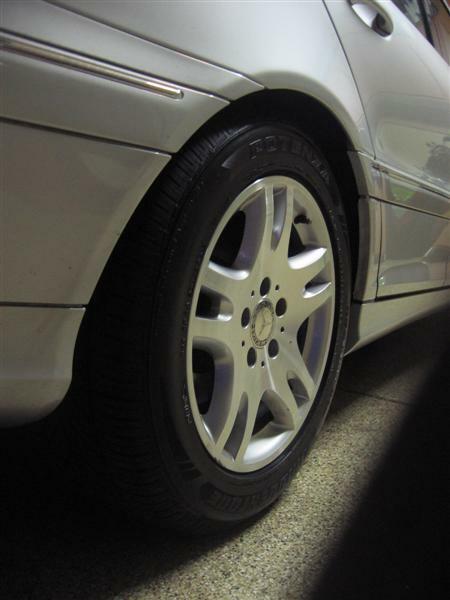 I have the stock 07 Sport rims on my 05 C230K. No issues at all. Best looking rims for these cars. I lucked up with mine, getting them for free in a 3-person rim-trade deal. I dunno where to tell you to search for them at decent prices for sale. Of you and Drew? Yep. 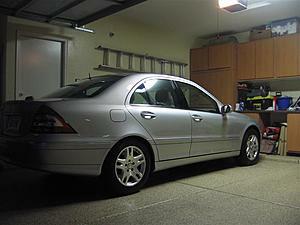 07 wheels fit perfect on my 05 c240 4matic, no issues, even w/ AWD. They can be had *new* for $112.